So far I’ve created a stylesheet and cleaned the document (see The Business of Editing: The AAE Copyediting Roadmap II), and tagged the manuscript by typecoding or applying styles (see The Business of Editing: The AAE Copyediting Roadmap III), inserted bookmarks for callouts and other things I noticed while tagging the manuscript (see The Business of Editing: The AAE Copyediting Roadmap IV), and created the project- or client-specific Never Spell Word dataset and run the Never Spell Word macro (see The Business of Editing: The AAE Copyediting Roadmap V). Now it’s time to tackle the reference list. I select the fixes I need and run the macro. Within seconds the macro is done. One note of caution: It is important to remember that macros are dumb — macros do as instructed and do not exercise any judgement. Consequently, even though Superscript Me fixes many problems, it can also create problems. My experience over the decade that I have been using this particular macro has been that the fixing is worth the errors that the macro introduces, even though they require manual correction during editing. The introduced errors are few, whereas the fixes are often hundreds. 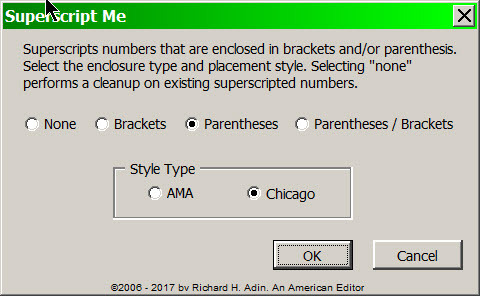 Tip: Superscript Me is a powerful, timesaving (and therefore profitmaking) macro, but as noted above, it is dumb and just as it can do good, it can do harm — especially to reference lists. 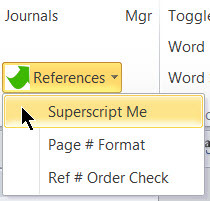 Before using Superscript Me on the manuscript, move the reference list to its own file. 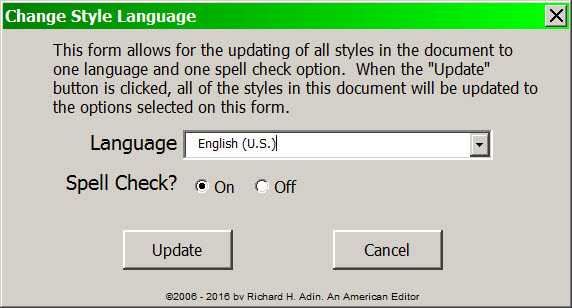 Doing so will ensure that Superscript Me makes no changes to the reference list, only to the main text material, saving a lot of undo work. By this point, the reference list has been generally cleaned and moved to its own file. Tip & Caution: Wildcard macros can be a gift from heaven or a disaster from hell. I like to do what I can to ensure they are a gift and not a disaster. Consequently, I move the reference list to its own file. I know I have said this before, but wildcarding is another reason for separating the reference list from the manuscript file. 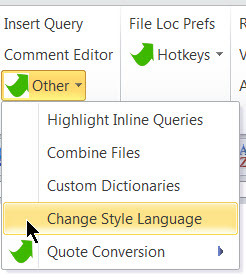 Often what I want changed in a reference list, I do not want changed in the primary text; similarly, what I want changed in the primary text, I do not (usually) want changed in the reference list. But like all other macros, wildcards are dumb and cannot tell text from reference list. 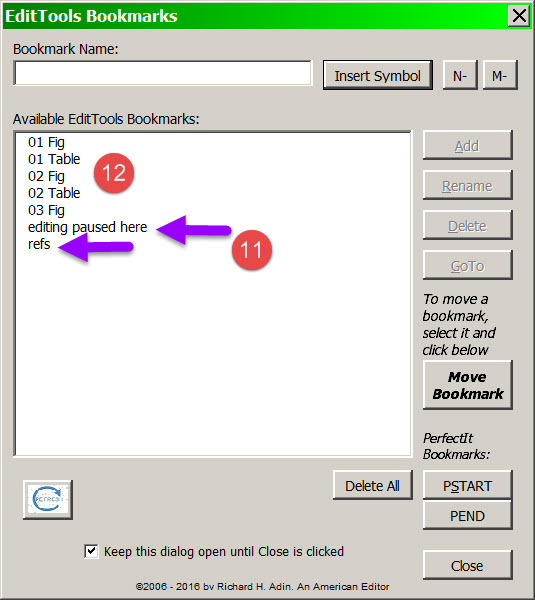 It can do no harm moving the reference list to its own file and working on it separately from the main text, so be cautious and move it. Smith A.B., Jones E. Z. 1986 Feb 22; 18: 22-30. 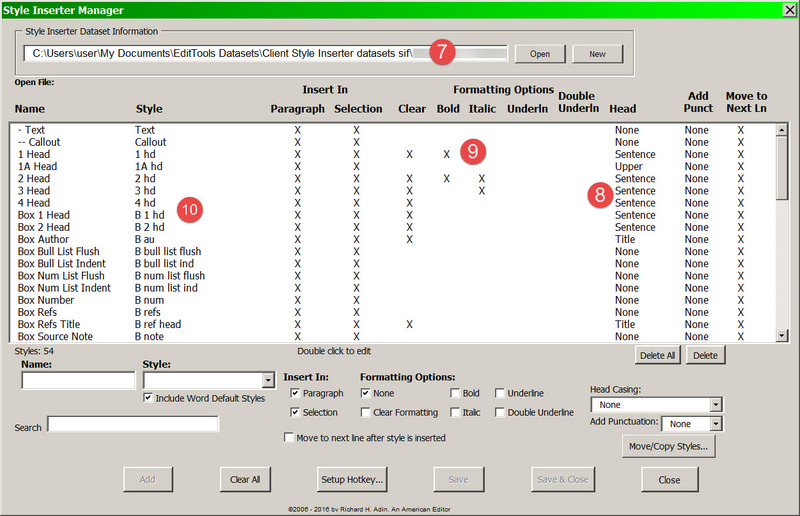 These formatting errors are fixable with wildcards and scripts. 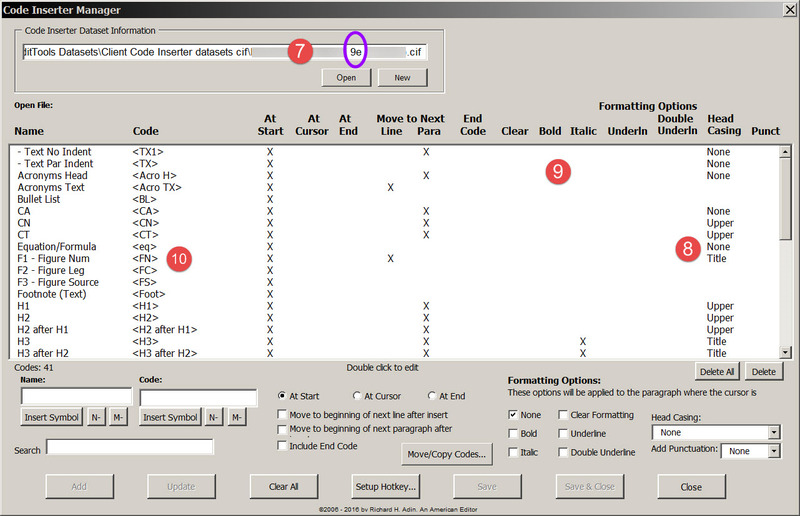 In the image, the active script file (#1) is identified and what it does (broadly) is described in the description field (#2). The wildcard macros that are included in the script and the order in which they will run are shown in the bottom field (#3). Included is a description of what each of the included wildcard macros will do (#4). For example, the first wildcard macro that the script will run will change Smith, C., to Smith C, and the second wildcard macro to run will change Smith, A.B., to Smith AB,. 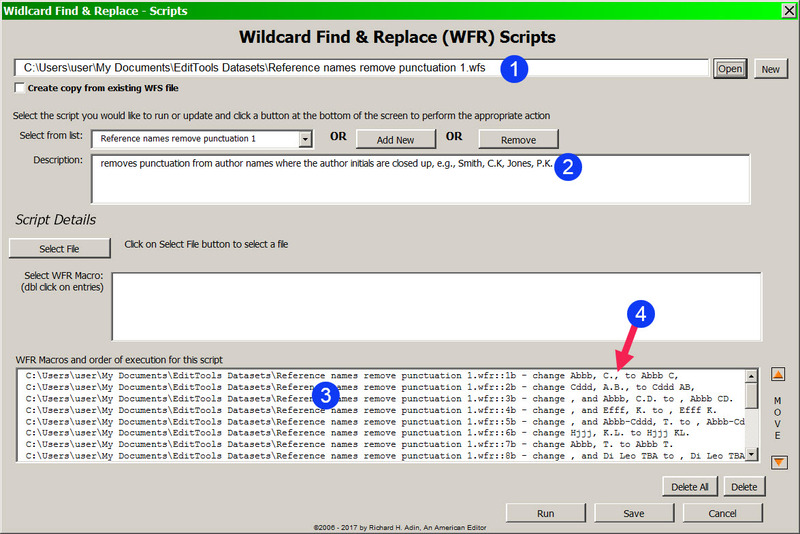 The wildcard macros were created using the Wildcard Find and Replace (WFR) macro shown below. In the image, the example wildcard macro (arrow) is the same as the second macro in the script above, that is, it changes Smith, A.B., to Smith AB,. With some projects I get lucky and the authors only have a few references that are a formatting mess and when there are only a messy few, I fix them manually rather than run the macros. 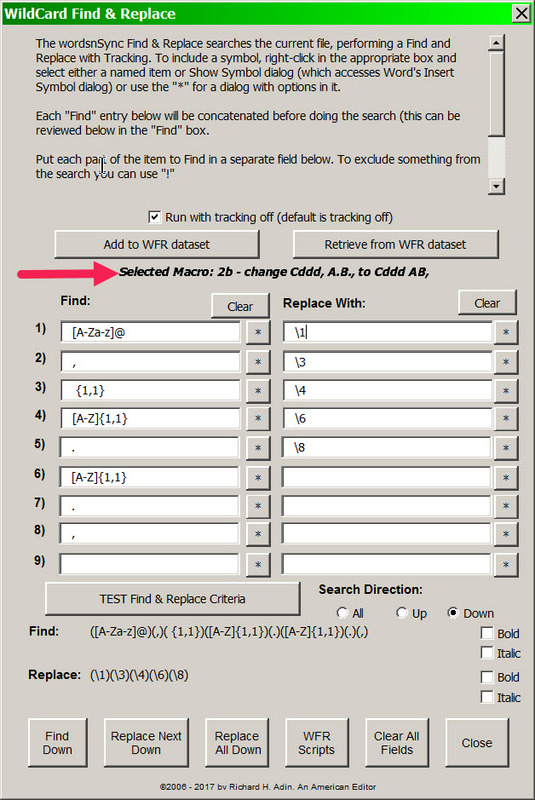 If the references are in pretty decent shape (formatwise) so that I do not need to run WFR, I will run the Page Number Format macro (shown below) to put the page range numbering in the correct format For example, the macro will automatically change a range of 622-6 to 622–626, 622–6, or 622. At long last it is time to run the Journals macro. As my journals datasets have grown, they have made reference editing increasingly more efficient. 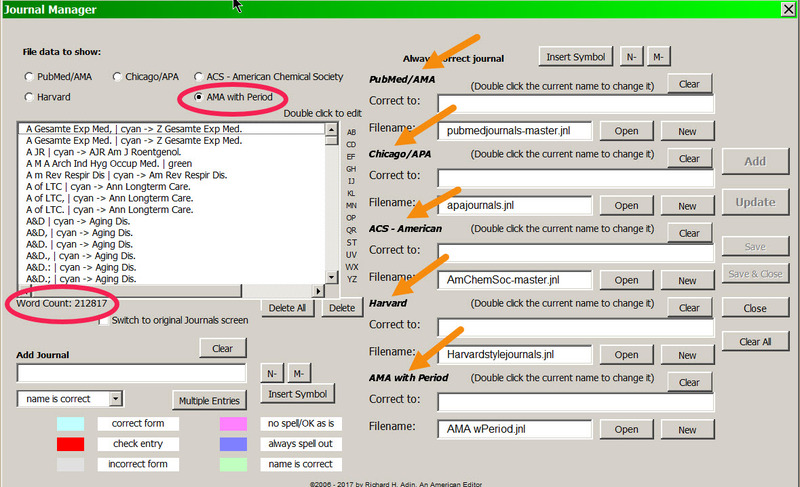 It takes time to build the datasets, but the Journals Manager (shown below) lets me build multiple datasets simultaneously. As shown in the image, I can build five datasets (arrows) simultaneously. My primary dataset — AMA with Period — has 212,817 journal entries (see circled items). 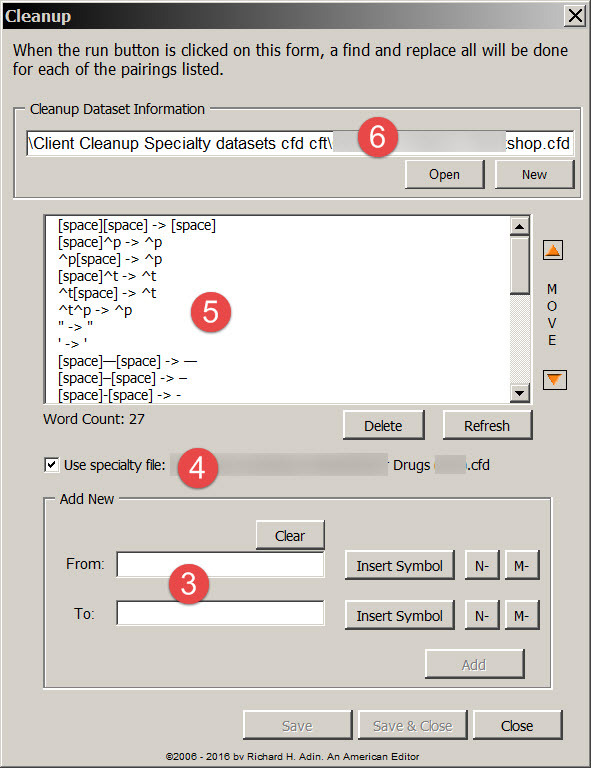 The Journals macro searches through the reference list for journal names and compares what is in the reference list against what is in the chosen dataset. 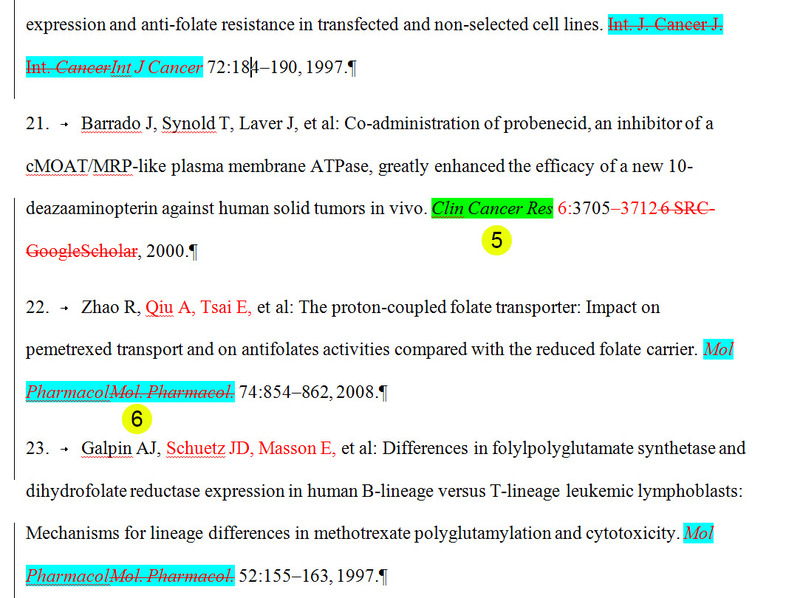 If the name in the reference list is correct, the macro highlights it in green (#5), as shown below; if it is incorrect, the macro corrects it and highlights the change in cyan (#6). All changes are done with Tracking on. The Journals macro does two things for me: First, if the incorrect variation of the journal name is in the dataset, it corrects the incorrect journal name so that I do not have to look it up and fix it myself (see #6 above). If the incorrect variation is not in the dataset, the macro makes no change. 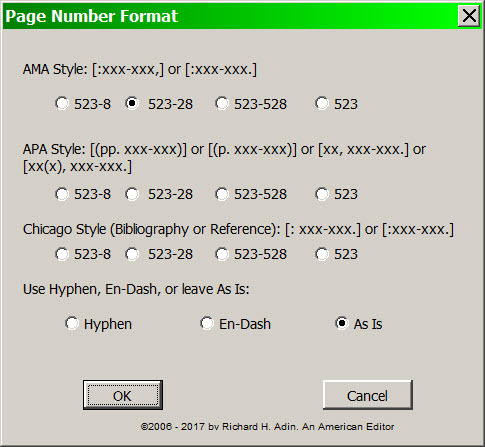 For example, if the author has written New Engand J. Med but that variation is not in the dataset, it will be left, not corrected to N Engl J Med. When I go through the reference list, I will add the variation to the dataset so it is corrected next time. Second, if the journal name is in the dataset, it highlights correct names, which means that I know at a glance that the journal name is correct and I do not have to look it up (see #5 above). It is true that the names of some of the more frequently cited journals become familiar over time but there are thousands of journals and even with the frequently cited ones with which I am familiar, correcting an incorrect name takes time. It is important to remember that time is money (profit) and that the less time I need to spend looking up journal names, the more profit I make. 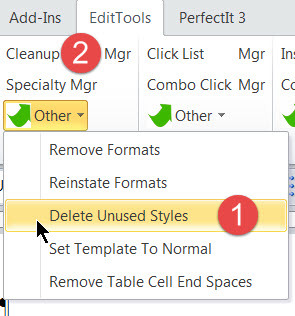 After I run the Journals macro, I open the Journals Manager (see above) and I go through the reference list, doing whatever editing is required and fixing what needs fixing that my macros didn’t fix. Because of the current size of my journals datasets, there aren’t usually many journal names that are not highlighted. When I come to one that is not highlighted either green (indicating it is correct) or cyan (indicating it was incorrect but is now correct), I look up the name and abbreviation in the National Library of Medicine online catalog and other online sources. When I locate the information, I add it and the most common author variations (based on my experience editing references for more than 30 years) to the five datasets via the Journals Manager. I take the time to add the journal and variations because once the variations have been added, I’ll not have to deal with them again. Spend a little time now, save a lot of time in the future. 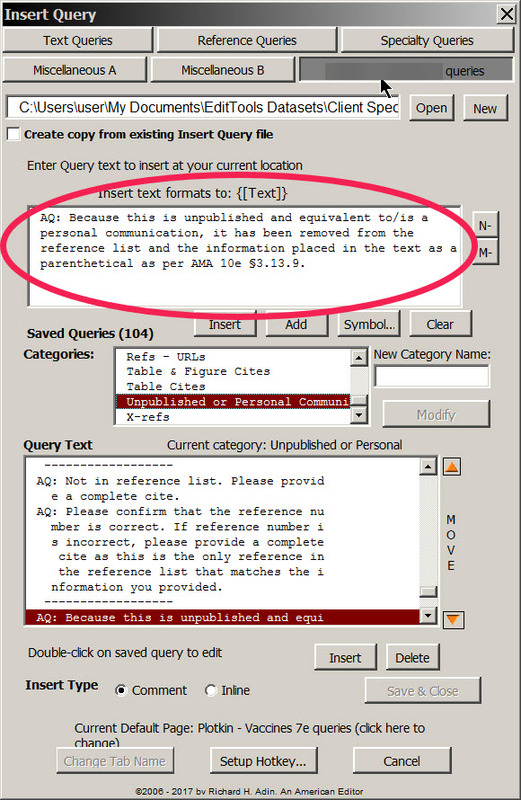 When I come to the in-text callout during the manuscript editing, I move the reference text to the manuscript, delete the callout and the reference, and renumber using the Reference # Order Check macro (which is discussed in the later essay The Business of Editing: The AAE Copyediting Roadmap VIII). Now that the Journals macro has been run and the references edited, the next stop on my road is the search for duplicate references, which is the subject of The Business of Editing: The AAE Copyediting Roadmap VII.